Vehicle redesigns are an expensive and risky investment for car manufacturers, although they’re also a necessity to keep up with stiff competition. General Motors’ SUV line is undergoing a major overhaul. Both the Chevy Equinox and Chevy Traverse are redesigned this year along with the Buick Enclave. This week, I got behind the wheel of the new 2018 Traverse, an SUV I hadn’t driven for a couple years. 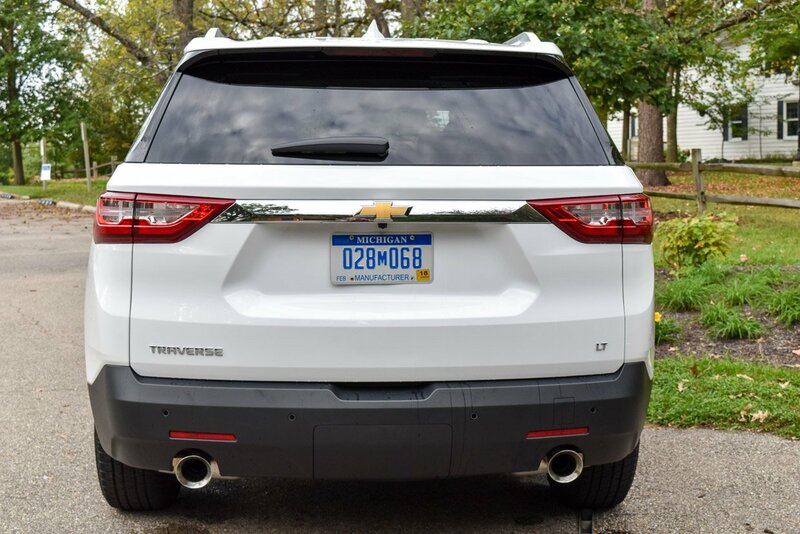 My last recollection of the Traverse was not so stellar, so it was good to hear of the redesign and the whole new look of this SUV. The metamorphosis is rather impressive. The Traverse doesn’t look or feel anything like what I remember. This is a thoroughly modern SUV in the truest definition. 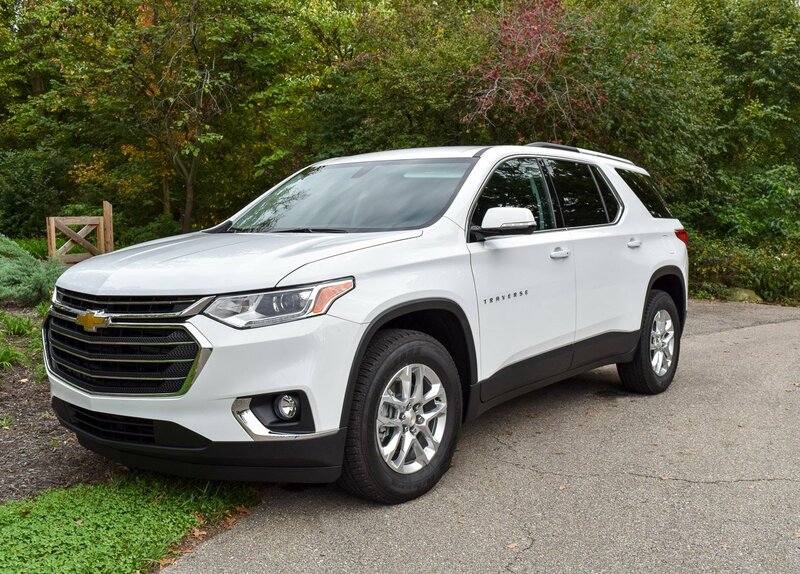 Even with the modernized overhaul, the Traverse still looks stout and like a utility vehicle, instead of these frilly, gimmicky crossovers that seem to be all the fad lately. And as hefty as the Traverse actually looks, it actually drops in overall size and loses 400 pounds from last year’s model. That drop in weight is a win-win as it helps the Traverse gain in power and fuel economy, and thanks to a new platform design, the Traverse actually gains in interior and cargo space. The new Traverse shares its platform with the new Buick Enclave, which is also redesigned for 2018. Even to the average joe, one glimpse of this new Traverse and you can tell it’s different. It looks more athletic. The Traverse compares well to other competitors like the Honda Pilot. In a crowded, competitive segment, the Traverse is now a contender. The 3.6-liter V6 engine from the 2017 model year carries over to the 2018 version, although there’s a bit more power this year, and the weight reduction helps too. The engine now makes 310 horsepower and has a new 9-speed automatic transmission. This is one of my favorite new transmissions I’ve experienced. Other 7+ speed transmissions have left me underwhelmed with inefficient or weird shift points, but this one is smooth and efficient. The engine still doesn’t feel overly powerful, and with the built-in start/stop technology, it’s not exciting off the line. However, I think the rather reserved performance of the Traverse works in its favor. Before the Traverse felt underpowered, now it just feels as it should be. Plus, it’s capable of towing 5,000 pounds, making it competitive within the segment of other 7-passenger SUVs. The reduction in weight brings a gain in overall fuel economy for the 2018 Traverse. It has an EPA rating of 18 mpg/city and 27 mpg/highway. In a week’s worth of suburban driving I averaged 22 mpg. This is average fuel economy for the segment and shows a gain over the 2017 version. Front-wheel drive is standard, but all-wheel drive is an option. My tester had the front-wheel drive, and though I am an admitted AWD snob, I found the Traverse with FWD to be fine in good weather conditions, although I’d question how it’d perform in the snowy Midwest without AWD. The interior of the new Traverse is where it really impresses. Inside, it feels more like a minivan than an SUV, and that’s a compliment. Too often, SUVs are cramped for passengers, especially in that third row. The Traverse is available as an eight or seven seater. My tester had the second-row captain’s seat, which only add to the cavernous feel of the cabin. I’d recommend foregoing the second-row bench seat in favor of this seating option, as it allows easier access to the third row and just increases the legroom and shoulder room further. There’s a net gain of three inches in rear legroom for the 2018 model year, and even the third row gains some space. 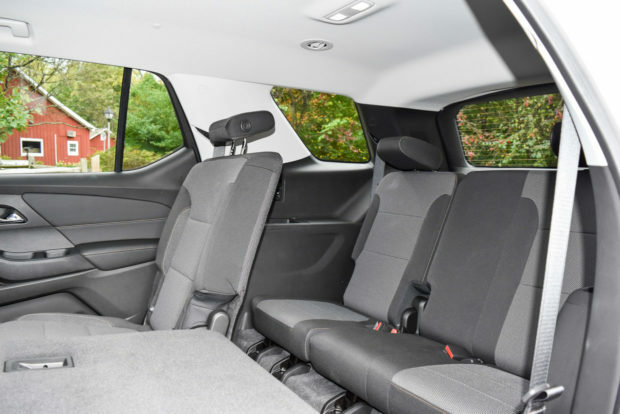 With Chevy’s new Smart Slide system, accessing that back row is even easier and allows for a child seat to stay latched into the second row while being moved forward and angled down. The GM engineers put a lot of thought into designing the interior toward families. 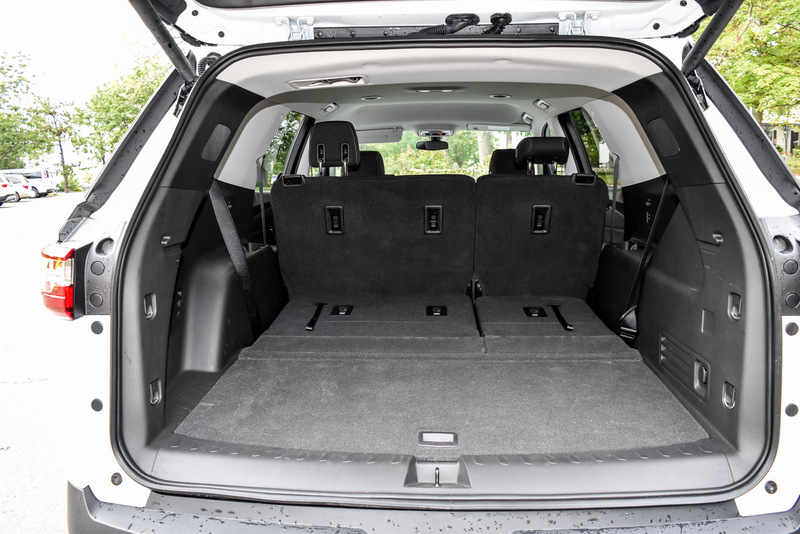 Overall cargo capacity is bigger than it’s ever been in the Traverse, and puts this mid-size SUV at the top with an impressive 98.5 cubic feet of maximum cargo room. The infotainment system in the Traverse is improved too, although not cutting-edge. 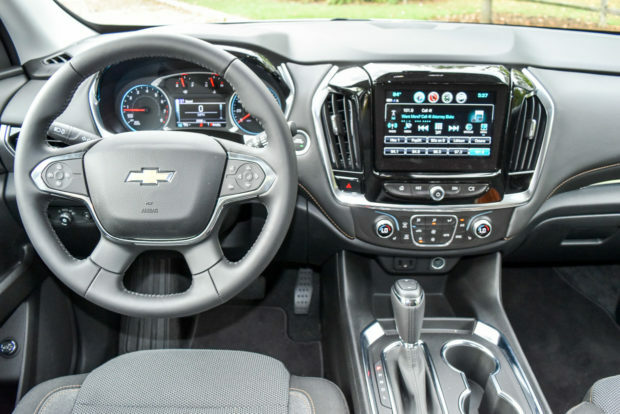 There’s no wow factor with Chevy’s MyLink infotainment system, but it’s easy to use and the 7-inch touchscreen is responsive. There’s compatibility with Apple and Android systems, and a thoughtful six USB ports (hurray for USBs!). There’s available 4G LTE WiFi for up to seven devices through an OnStar subscription too. Reinforcing the family-friendly concept, there’s a rear-seat reminder that dings every time the vehicle is turned off to remind the driver to check the back seat. This may seem ridiculous, but if it saves one child from being left in a hot car by a distracted parent, then it’s a good thing. There’s also a rear-view camera and surround vision which is a network of cameras that offer a bird’s eye display surrounding the Traverse for the driver in parking situations and at low speeds. The base Traverse has a starting price under $30,000 and there are seven trim options. That’s a few too many if you ask me, as I think it will confuse consumers. My tester was the 1LT Cloth trim, which, as the name says, has a cloth interior instead of leather. Most of the vehicles I review have a fancy leather interior, so I forget just how much I like cloth upholstery in vehicles. The stitching on the seats is high quality, and they’re quite comfortable and supportive. The LT trim, which is the middle-of-the-road of the seven trims, comes with the aforementioned captain’s seats as well. It also has roof rails. The convenience and confidence package will surely be popular options as this brings parking sensors, blind-spot monitors, hands-free power liftgate, and an upgraded 8-inch touchscreen. With these options, the Traverse feels loaded and ready for family adventures. The LT trim has a starting price of $34,550, and my tester had a final MSRP of $37,330. If the Traverse is any indication, the 2018 model year will be a good one for General Motors. 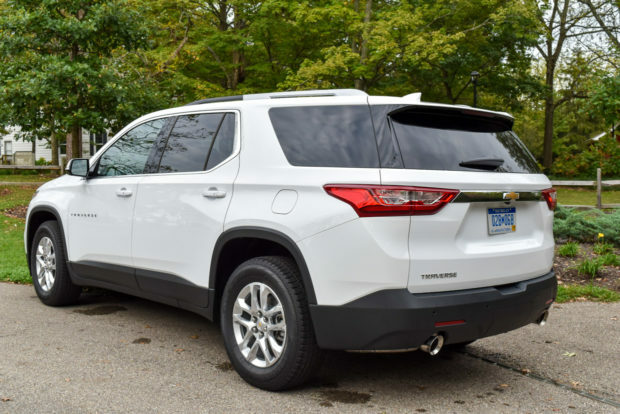 Chevy’s midsize SUV is again ready, willing, and able to compete in the segment with all new looks, more space, less weight, and even more power. It’s a new model year, and a fresh start for the Traverse.